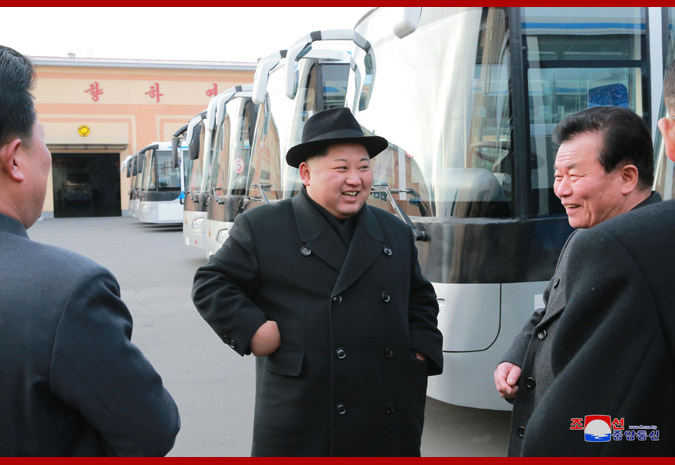 Pyongyang, February 1 (KCNA) -- Respected Supreme Leader Kim Jong Un gave field guidance to the newly-remodeled Pyongyang Trolley Bus Factory. Looking at the factory with a bright smile on his face, he said that all buildings are neat and fine and environment around the factory is clean and it can be seen that great efforts were made to do so. He went round the room for the education in the revolutionary history and the room dedicated to the history of the factory. He said that the Pyongyang Trolley Bus Factory was founded thanks to the noble intention of President Kim Il Sung who set forth a policy of operating trolley buses in the capital to make the citizens of the capital live in a cultured way in the pollution-free city. He noted that seeing the pictures of the President watching "Chollima-72" type trolley bus in May 1972 and of leader Kim Jong Il watching a large bus "Kwangbok Sonyon" in April 1990 reminded him of devotion and efforts of Kim Il Sung and Kim Jong Il to solve traffic problem of the capital. He stressed that officials and workers of the factory should bear in mind the honor and pride of working at the glorious worksite associated with patriotic sweats of Kim Il Sung and Kim Jong Il and their love for people and make constant innovations and continued progress. Going round a processing workshop, electricmotor workshop, trolley bus assembly workshop, overhaul workshop and other places of the factory, he learned in detail about the modernization and production. He watched new-type trolley buses produced at the factory. In the trolley buses he learned in detail about their performance and quality of fittings. And he said that they are proud creation associated with the revolutionary spirit of self-reliance displayed by our workers and he is encouraged and pleasant to see them, adding that Kim Il Sung and Kim Jong Il would have been happy if they had seen citizens of the capital with a broad smile on their faces going to and from worksites aboard new-type trolley buses. He stressed the need to make better design of trolley bus, make the mark in a peculiar style and coat them more presentable and make fittings as required by the people so that they may not feel inconvenience and make the trolley bus, mass transportation means, reflect the appearance of the capital city of Pyongyang. Saying that it is his intention to turn the Pyongyang Trolley Bus Factory into world-class base for producing trolley buses, he set the goal of second phase modernization to be attained by the factory and took a benevolent measure for it. Expressing expectation and belief that officials and workers of the factory would fulfill their duty in the work to attain the new goal set by the Party, he had a photo session with them. Accompanying him were Vice-Chairman O Su Yong and Vice Department Director Jo Yong Won of the Central Committee of the Workers' Party of Korea. Respectfully, could you add some features from the Korean version of the site to the English? I believe more things in English will help the lazy American imperialists understand our glorious Korea!